This elegant terrine is for a special-occasion lunch or dinner. It does take some time to put all of the ingredients together, but the final result is really worth the effort. Although the recipe calls for you to marinate the duck breast overnight, it will work out fine with only a couple of hours. The terrine is cooked the day before you want to serve it and refrigerated, which gels the meats together and improves the flavor. The terrine also freezes beautifully. Remove the skin from the duck breast and discard. Slice the duck breast into strips 1/4-inch thick. Mince 1 garlic clove and gather it into a pile on your cutting board. Sprinkle 1/4 teaspoon Kosher salt over the garlic. Using the back of a chef's knife, grind the salt into the garlic, forming a paste. Toss the duck breast strips, garlic paste and 1/4 cup of the Madeira or port in a bowl. Cover and refrigerate for at least 2 hours or overnight. Melt the butter in a skillet over medium-high heat, and add the chopped shallots. Sauté 3 minutes, then add the chopped mushrooms and sauté 5 minutes, Stir in the remaining 1/4 cup of Madeira or port, and allow it to cook off. Take the skillet off the heat. Cut the skin off the duck legs, then using a small sharp knife, slice the duck meat off the bone and coarsely chop. Put the chopped duck leg meat, chicken livers, 6 ounces bacon, the eggs, 2 garlic cloves, dried thyme, 2 teaspoons black pepper, clove, nutmeg and ginger in the bowl of a food processor. Pulse several times to chop everything evenly and scrape down the sides of the processor bowl, then puree until smooth. Transfer to a bowl. Combine the bread and milk in a small bowl, until just softened, then gently work the bread with your fingers into the duck-chicken liver mixture. Heat a little bit of olive oil in a skillet, and fry a small piece of the forcemeat. Taste, and add salt and pepper as needed. Preheat oven to 350 F. Line a loaf pan or terrine with several layers of plastic wrap, allowing for overhang all around. Lay the remaining strips of bacon vertically in the bottom of the loaf pan, leaving the ends to hang over the outside of the pan. Divide the forcemeat into three portions. Using an offset spatula, spread one-third of the forcemeat evenly along the bottom of the terrine. Divide the mushrooms into two portions, and spread one portion over the forcemeat. Lay one-half of the marinated duck strips over the mushrooms, then spread the second layer of forcemeat over the duck strips. Repeat with the forcemeat, mushrooms and duck strips two more times. Press down on the terrine to compress. Fold the bacon ends over the top, then fold the hanging plastic wrap over the bacon. Cover again with heavy-duty foil or with the terrine lid. Set the terrine in a roasting pan for the bain-marie just large enough to hold the terrine. Bring a kettle of water to the boil. Put the roasting pan into the oven, then pour the boiling water into the pan so it's halfway up the terrine. Bake 1-1/2 hours, or until the internal temperature reads 140 F.
Carefully take the terrine out of the bain-marie and discard the foil. Fold a new large piece of foil four times so it fits on top. Weight the terrine down with a foil-wrapped brick or canned vegetables or fruit, then let it cool 1 hour. Refrigerate overnight. One hour before serving, remove the weight and foil. Loosen the plastic wrap from the top. Run a thin knife around the edges of the terrine. 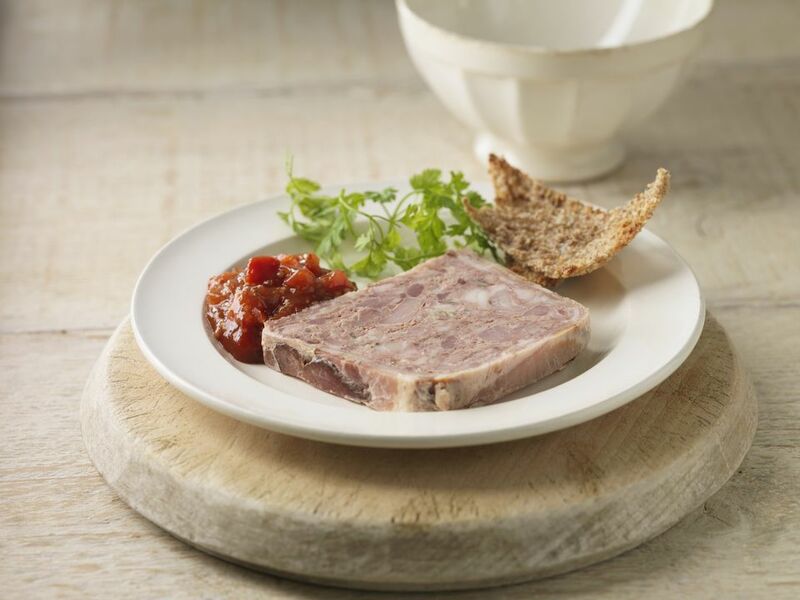 Hold a plate on top of the terrine, then invert the plate so the terrine pops out onto the plate. Carefully remove the plastic wrap. Cut into slices and serve with cornichons or gherkins, Dijon mustard, and sliced baguette.